We have received the following details from Linda Wright – mother of Casey Wright. 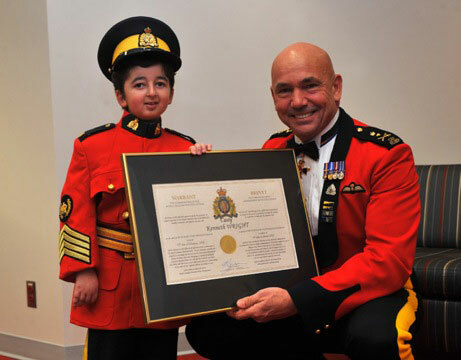 Commissioner Bob Paulson presents Honorary Staff Sergeant Major Casey Wright with his official Warrant in a private ceremony at BC RCMP HQ on Friday Nov 15th. 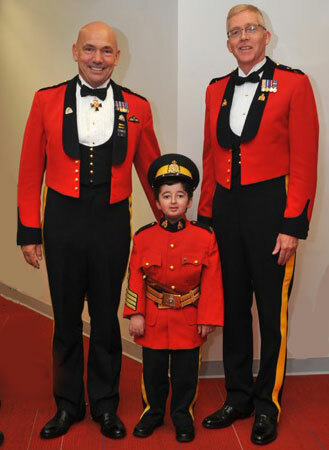 Also in attendance were Superintendant Dave Critchley and Staff Sergeant Major John Buis from the Burnaby detachment. 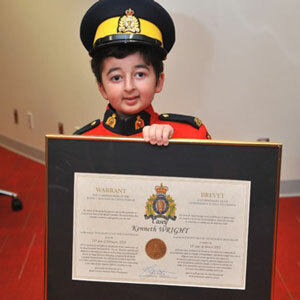 Both myself and my husband Larry are very proud of Casey and the Canadian RCMP. 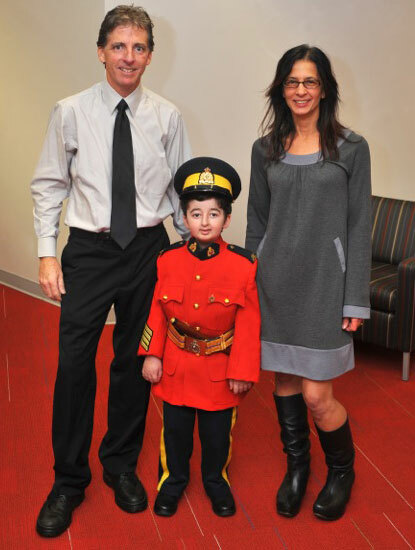 Casey has done a lot with the Cops for Cancer and the Sunshine for Dreams charity. Casey is going to school a couple days full time and the other days , he has therapy at home. He is still working hard to recoup his arm and hand and there is progress although a bit slower now. But as Casey does, he keeps trouping along with his happy positive self. Next up is the Crystal Ball coming on Nov 28th, a big fund raiser for BC Children’s Hospital. You may have remembered last year Casey was there and made a video to thank the sponsors and the video won first place in North America. There were twenty five Children’s Hospital’s involved and Casey was number one. So what are they going to this year ?????? Stay tuned for this years Big Event !!!!!!! Here is a link to last years video. Thank you all for thinking of Casey and family.